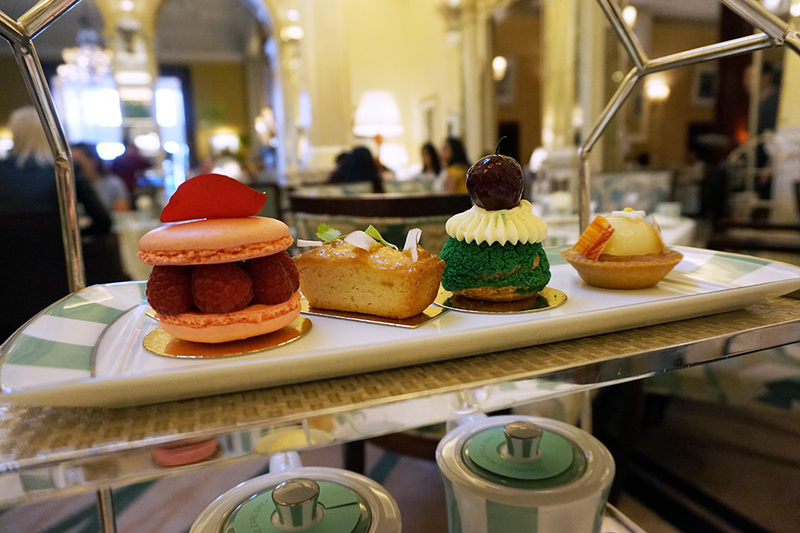 As baby is pretty much imminent and we were running out of time to do things that we wanted to before her arrival, we decided to use my Claridges afternoon tea voucher (thanks Little Siss!) and visit the Victoria & Albert Museum for our wedding anniversary. I hadn’t been to the museum for many years and so much had changed, which was a shame in some respects, but there had also been many improvements such as the inner courtyard area. This now hosted a shallow pool and sitting platforms, encouraging you to dabble your toes on a hot day and take in the beautiful architectural features. 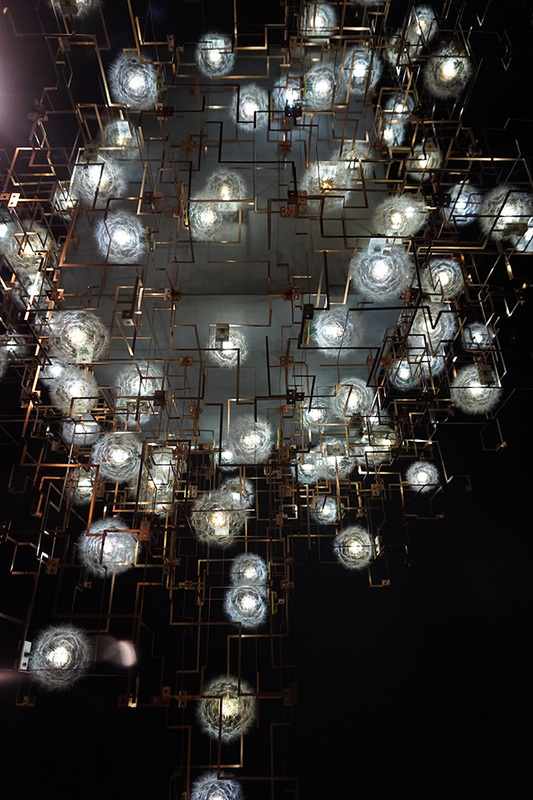 Like a lot of places, the V&A features an incredibly over priced eatery, but everything looked lovely and you would go there for a treat not as a necessity! 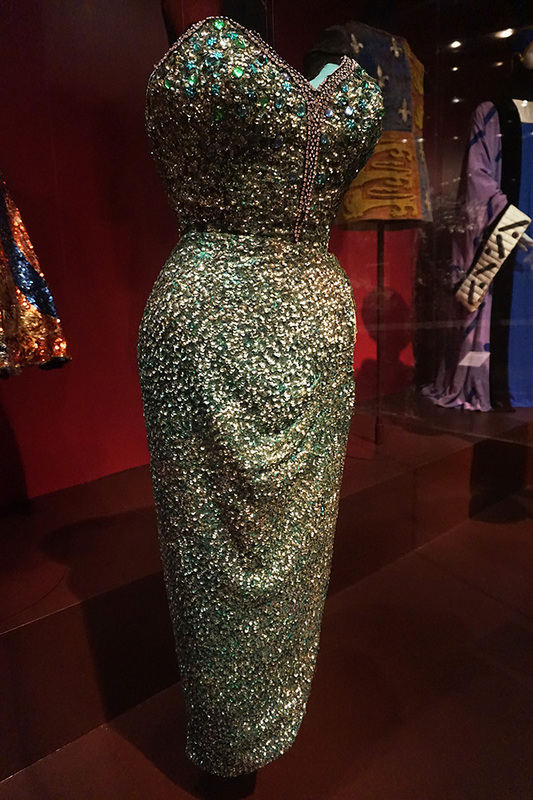 This incredible boned and highly structured dress was worn by Joan Rhodes. Joan was a glamorous ‘Strong Woman’, famed for her 50 cm waist and her ability to break 25cm nails with her teeth, bend steel bars and rip up telephone directories (250, 000 of them in her career!). 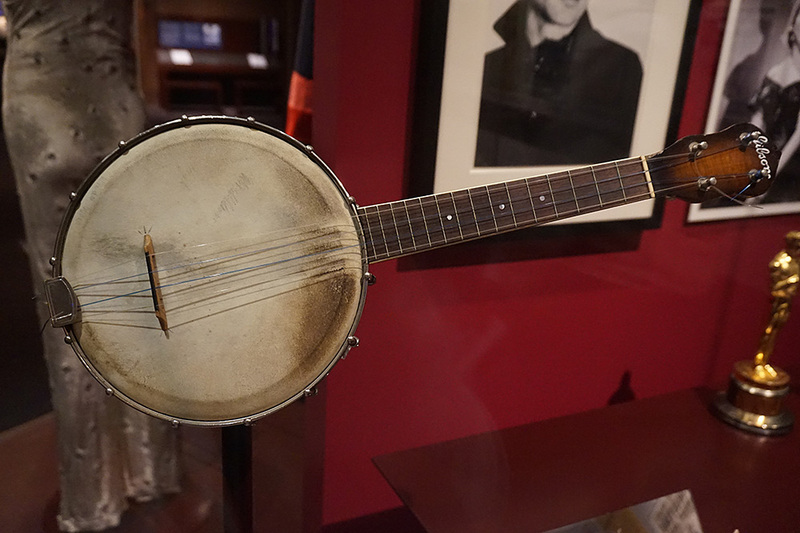 1930’s banjo owned by George Formby. He actually used to re-string his banjos with fishing line. 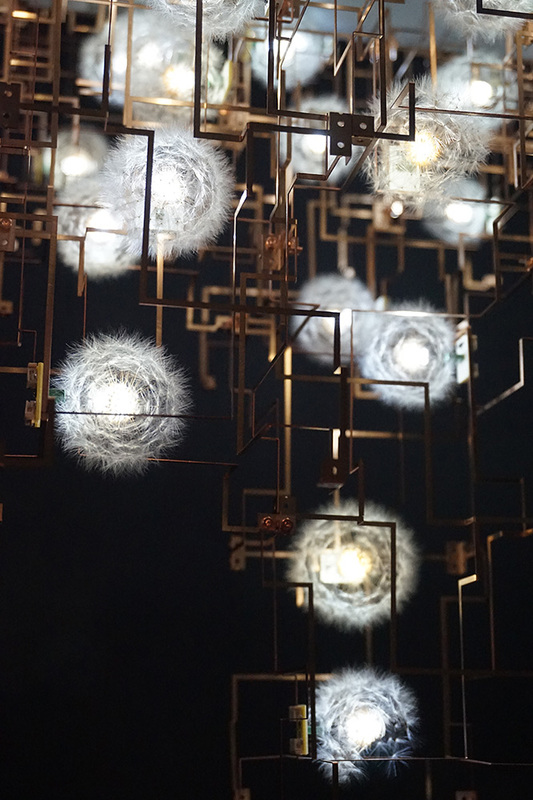 Designed by Studio Drift in 2011, this amazing Fragile Future concrete Chandelier features real dandelion seed heads and is powered through a 3D bronze circuit that conducts the electricity to the bulbs inside the dandelion heads. Not a wire in sight! 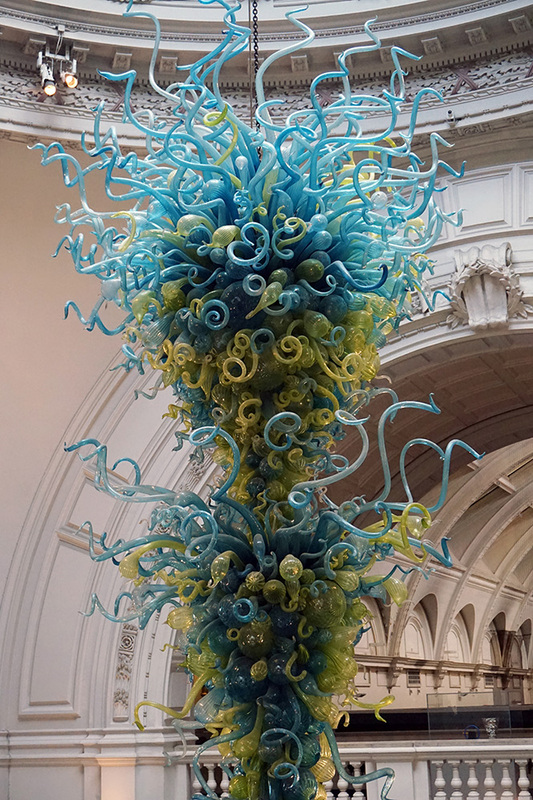 A stunning glass chandelier sculpture by Dale Chihuly. I remember first seeing his pieces at Art in Action many years ago. It is wondefrul seeing them in such places as the V&A and Claridges now! Vivien Leigh’s costume from Duel of Angels (1958). It has a very ‘New Look’ feel to it, even though it is much later. 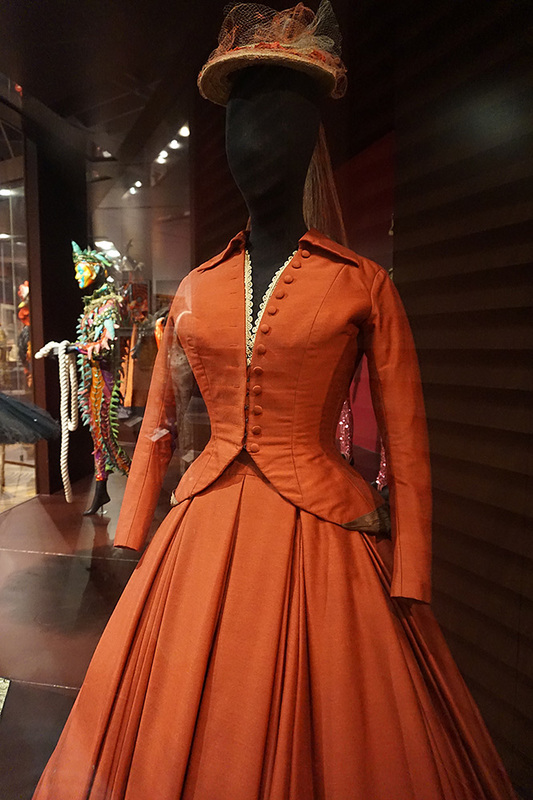 Designed by Christian Dior. A fabulous flask given by Noel Coward to each of the cast members on the opening night of his operetta Bitter Sweet. 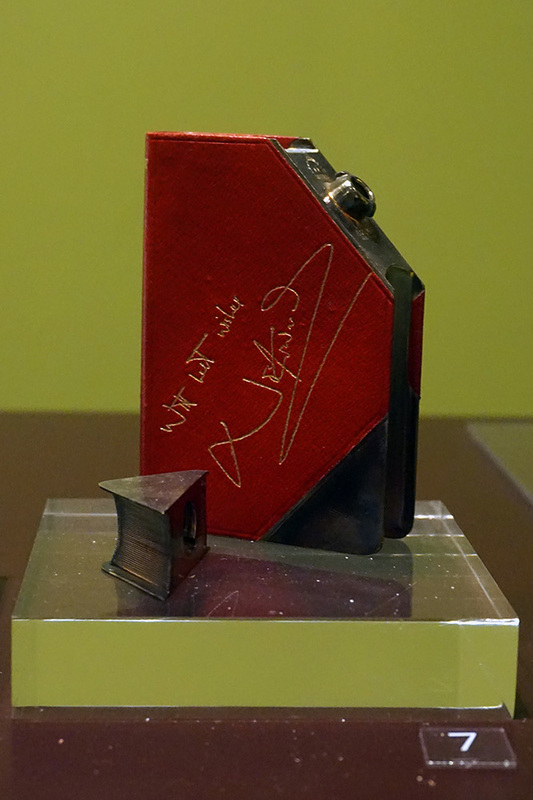 It is designed to look like a little book and in inscribed ‘with best wishes Noel Coward’. Frustratingly, this amazing costume had no information as they were still working on the exhibit. 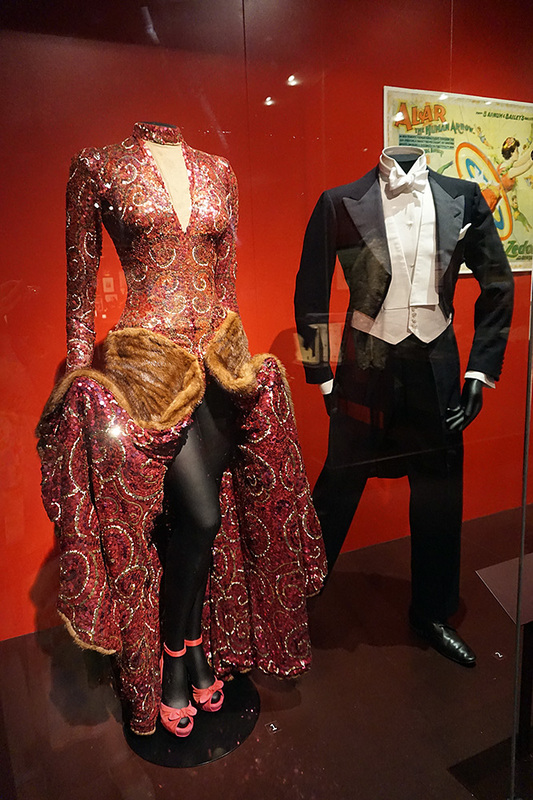 I have a photo of this outfit saved somewhere from many years back and know it was worn by a famous starlet in a film, but cannot say who or where! 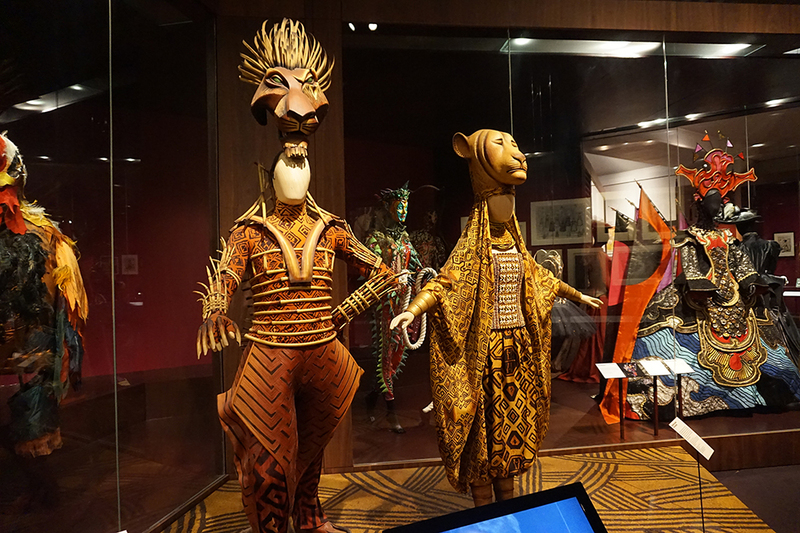 Fantastic costumes from the Lion King stage production! The V&A has rather a lot of religious artifacts, but I was more interested in the jewellery section (absolutely STUNNING pieces, but no photography allowed! ), the costumes and the marble statues. The museum now has a separate site housing the children’s things (which I had not realised as I was hoping to see the doll’s houses and vintage toys) and doesn’t seem to have the Egyptian items I remember fondly from my childhood. It was still a lovely outing and the building itself is spectacular if you are a fan of gothic architecture! 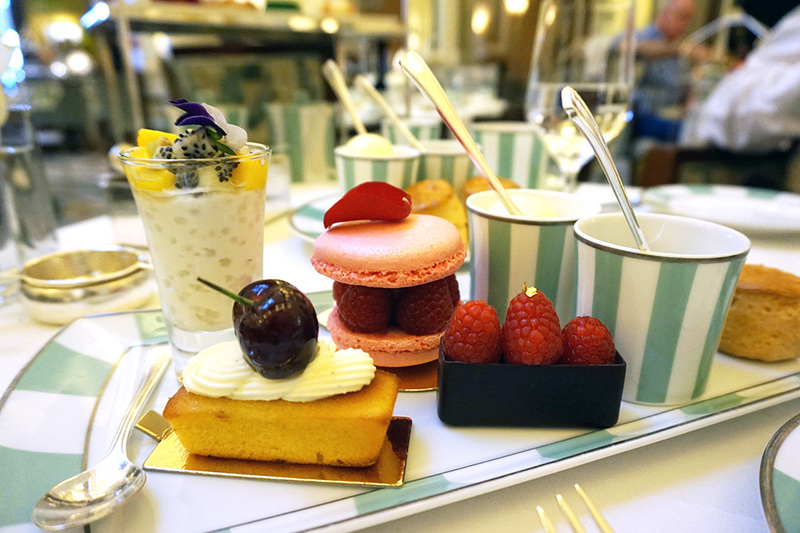 We couldn’t wait for our afternoon tea at Claridges! We are a big fan of these and have already been lucky enough to have some at The Ritz, so the comparison would be very interesting. Claridges has some wonderful Art Deco features and detailing. Even the door bell has me weak at the knees! The decor was fabulous and airy, but I guess that is mainly because you are literally sat in an atrium foyer area whilst having your tea. 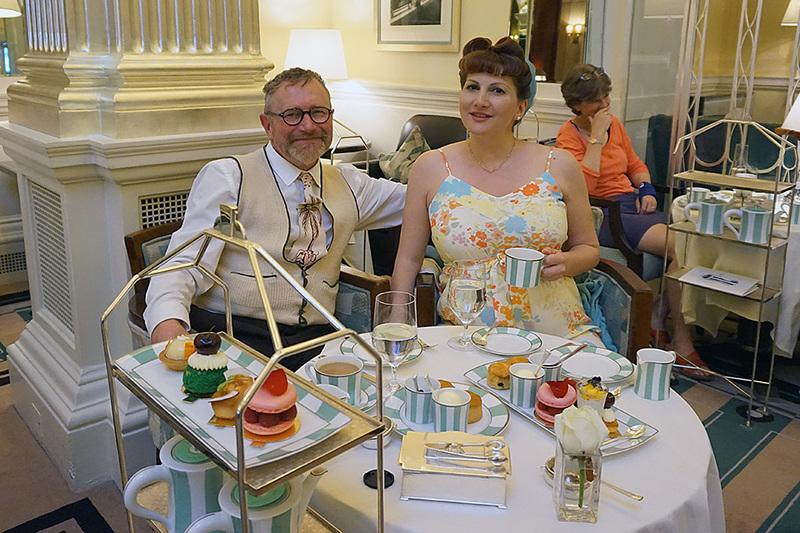 I found it less pretentious than the Ritz in some ways; no need for shirt and tie (but relieved to see that everyone was till dressed smartly!) and the food was just as good! I was served gluten free finger sandwiches and my pregnancy dietary requirements were all catered for. The bread was wonderful (sometimes gluten free can be rubbery or dry) and they happily topped up the sandwiches when plates were empty (Ettington Park could learn a thing or two about this, they actually charge extra for more of their measly pickings and don’t tell you until you receive the bill!). The scones (also gluten free) were delicious and served with clotted cream and a special fruit jelly infused with tea! Then came the delicacies such as a little coconut and passion fruit tapioca pudding and wonderful treats. We were also brought out another cake plate especially for our anniversary! The tea (I am a sucker for Earl Grey) was wonderful and topped up frequently by our allocated server. The only thing that was a little frustrating was that you had to wait to have the tea served for you, rather than being able to relax and do it yourself. This was literally the only gripe and the rest was wonderful. I think I actually preferred it to The Ritz! Oh I forgot to say! There was a cello and pianist there playing not only classics such as A Nightingale Sang in Berkley Square, but also renditions of modern songs like Michael Jackson’s Billie Jean! Fantastic! The Mew’s plus bump enjoying our wonderful afternoon tea! 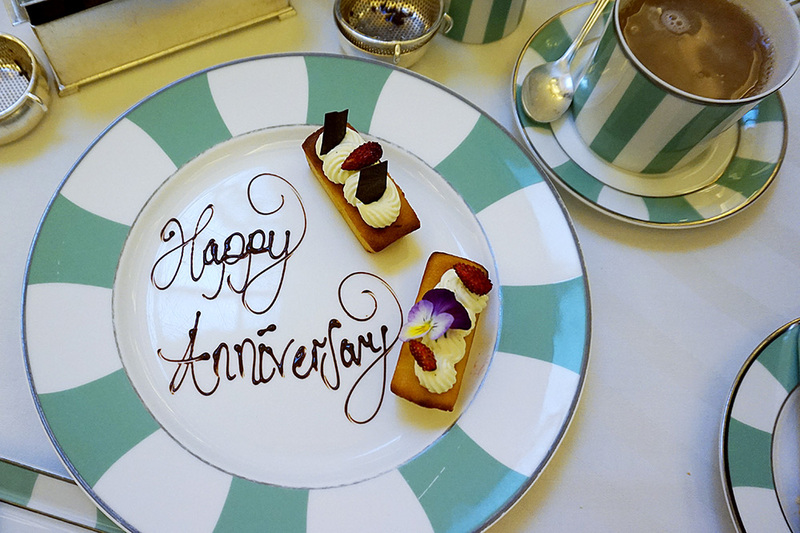 Our wonderful ‘Happy Anniversary’ surprise at Claridges! My scrumptious gluten free selection of treats! Posted in Day to Day and tagged afternoon tea in london, best afternoon tea, claridges, claridges afternoon tea, Dale Chihuly, ettington park, george formby banjo, gluten free afternoon tea, joan rhodes, kitten von mew, noel coward hip flask, the ritz, V&A Museum, victoria and albert museum, vivien leigh costume. Bookmark the permalink.